Suspension trainers are up there with the best bodyweight equipment available. They’re super versatile, in that they can be used just about anywhere (at home, at the park, in a hotel room, etc.) and for what you get they’re not very expensive at all (well, most aren’t). 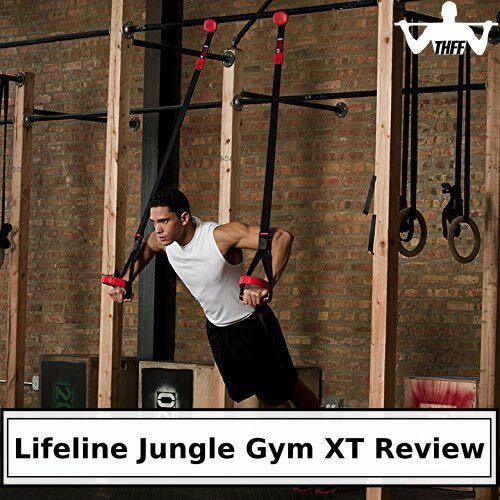 In this review, we’re looking at LifelineUSA’s suspension trainer, the Lifeline Jungle Gym XT. The XT is an upgrade on the original Jungle Gym, and it has a lot of new features, all of which we’ll go into more detail about further in the review. We will start by saying that if you’re looking for a really sturdy, split system suspension trainer to use primarily at home, then the Jungle Gym XT is definitely a worthwhile option. If, however, you’re looking for a portable suspension trainer that you can use in lots of different places, like the park or a hotel room, then the XT is really not the best option. The Woss Suspension Trainers are a much better choice if that’s what you’re looking for. With that out of the way, let’s get into the Jungle Gym XT review! The Lifeline Jungle Gym XT is very much an improvement on the original, and definitely stacks up to other popular suspension trainers like the Woss range and the TRX. Almost all suspension training systems offer an exceptional range of exercises and the Lifeline Jungle Gym XT is no different – you can use it to hit just about every muscle and muscle group in your body, which will allow you to do a superior full-body workout. The Jungle Gym XT uses a split anchor system (as opposed to the original Jungle Gym, which was single anchor), which has advantages and disadvantages in terms of what you can do and where you can do it. 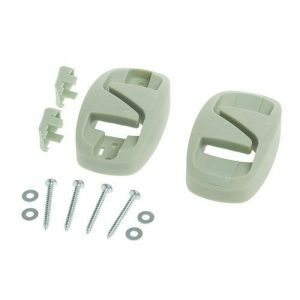 The split anchor system means that each handle has it’s own separate strap that you need to anchor to whatever is providing you support (e.g., a door, the wall or ceiling, pull up bar, etc.). In terms of the range of exercises, the major advantage of this system is that it’s much easier to do exercises that require full suspension of your bodyweight (e.g., chin ups and dips) than it is with single anchor suspension trainers (like Woss and TRX). Split anchor systems also allow you to vary the width of the straps (between narrow, medium, and wide), which produces a number of variations for each exercise. Another advantage is that single-handled exercises are easier and more accessible (because you just anchor one strap). In comparison, single anchor systems are harder to do full suspension exercises on, they generally have to have their handles looped together in order to perform single-handled exercises, and the width of the straps is fixed in a narrow position, which limits their versatility. The disadvantage of a split anchor system is that they’re not as easy to use with single, uneven anchor points such as a tree branch, meaning that they’re not as good as single anchor suspension trainers for use in places like parks and other outdoor areas. 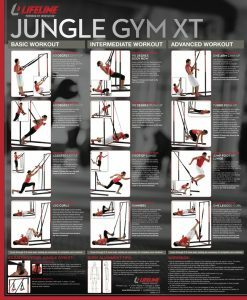 The Lifeline Jungle Gym XT comes with a workout chart (below) that outlines a basic beginner, intermediate and advanced workout, so you’ll always have some instructional information to fall back on. 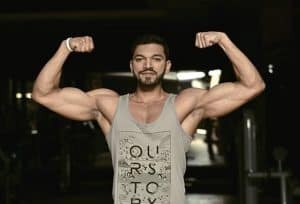 However, it is very basic, so if you want a particularly intense workout then you’ll have to find more information on the net, or come up with additional exercises on your own. Also, the chart is the extent of the instructions you receive with the Jungle Gym XT. It used to come with a DVD but that has been discontinued. Other systems, such as the TRX, have much more detailed instructional materials, such as video clips and apps. That said, Lifeline provide a more extensive beginner workout, intermediate workout, and advanced workout on YouTube. Plus, a simple search produces a heap of other great free videos for suspension trainer workouts, such as this one for beginners and this one for advanced users, so its not a significant issue. This is where the Lifeline Jungle Gym XT really excels. 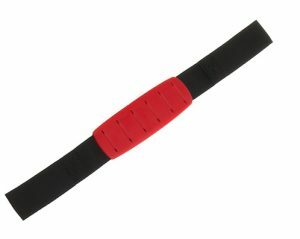 They’ve upgraded the XT so that it is really durable, and made from very high quality materials. The nylon straps are extremely strong. Each one has a capacity of 300 lbs, giving the complete suspension trainer a 600 lb capacity, which is higher than any other trainer. The handles and foot holds are made from a thermoplastic elastomer (TPE). TPE is a strong plastic that has a soft rubbery feel, which makes it really comfortable to hold onto and maintain a strong grip even when you start sweating. The ankle holds themselves are held into an open position, making them very easy to get into and out of. The downside to this, however, is that they don’t fold up easily, making the whole system quite bulky. 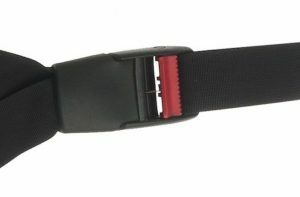 The cam buckles that you use to adjust the length of the straps are good quality and work really well. They have a rubber sleeve at the bottom that covers up the stitching of the nylon straps and prevents them from scratching your skin when you’re using the trainer. Also the cam buckle is oriented parallel to the handle, which also reduces the likelihood of it catching on your skin during use. Overall, reorienting the cam buckle is an improvement, but it does stop the handles from rotating when doing certain exercises, which can get annoying. 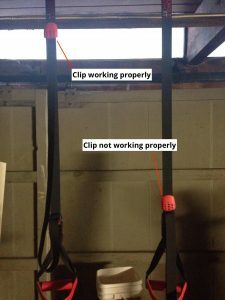 There are also a couple of plastic clips on the nylon straps that you can use to neaten up the slack and stop it from getting in your way during your workout. These seem to work really well at first, but after a while they stop working so well and start sliding down the strap, which causes the slack to get in your way and makes them pretty useless. Each of the Jungle Gym XT straps has a heavy anchor on the end, also covered in the TPE, that you can use as door anchors or regular anchor points when looped over something like a chin up bar. As door anchors, these work well if you want to use them at home or somewhere else indoors that doesn’t have an overhead beam, rafter, or bar to attach them to (like in the picture below). Note: make sure you use the door anchor on a door that opens away from the room you’re doing your workout in. All-in-all, the Jungle Gym XT is a well designed and strongly built suspension trainer. 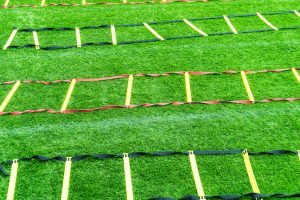 The Jungle Gym XT split system’s positives and negatives really play out in how easy it is to use. Having two straps makes it a bit difficult to adjust each one to the exact same length for different exercises. And when you don’t get the lengths the same, it can feel like you’re a bit ‘off kilter’ while you’re using them. Once you get them the same length, however, they are much easier to use than single anchor systems. This is because single anchor systems, like most of the WOSS range and the TRX, force you to use your core muscles to even up the strap length, making the workout more difficult, but also more effective. The split system is much more stable, and is definitely the best option if you are concerned about your stability or have a medical condition that may compromise it. If, however, you do want to use the Lifeline Jungle Gym XT as a single anchor system, then you have to loop the two heavy anchors on the end of each strap through the ‘Duro-Link’ anchor (pictured below), which you would then loop over something like an overhead beam or tree branch. Doing it this way is ok, but certainly not as good as a true single anchor suspension trainer. As we mentioned above, the foot holds are held in an open position, which is different from pretty much all other suspension trainers. 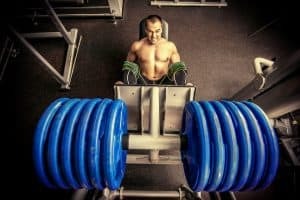 This makes getting your feet into and out of them really easy, and makes circuit training in which you have almost no rest time between exercises much smoother. The downside to this is that the foot holds can’t be folded up, and so the whole system takes up quite a bit of room. Therefore, unlike the TRX which packs away into a small bag, the Jungle Gym XT is really quite bulky and not the best option for a portable suspension trainer. There’s very little setup required with the Jungle Gym XT, it’s a real ‘plug and play’ type thing. Just take them out of the box, and you can start using them straight away, there’s no need to thread the straps through the cam buckles like with some other trainers. Just throw them over an appropriate door and off you can go. However, we’ve found that suspension trainers work best when they are anchored to a high, overhead point. 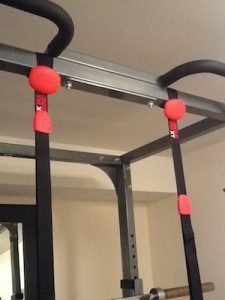 An overhead beam, pull-up bar, or rafter is ideal, but if you don’t have one of these and you don’t want to use them on a door, then you’ll need to get the wall / ceiling mounts. These screw into a high point on the wall, or into the ceiling and serve as the anchor point for the two straps. But, if you use them on a wall, then they pose their own problems because you want to get them at the exact same height, otherwise they make getting the straps the same length more difficult. The Jungle Gym XT tends to sit mid-range in terms of price. They aren’t as cheap as the Woss’, but are far less expensive than the TRX (as are almost all suspension trainers). They are the most durable, heavy duty suspension trainers, which we think makes them pretty good value for money. Overall, the Lifeline Jungle Gym XT suspension trainer is a great option for your home workout space, and we highly recommend it. While the split anchor system does have some downsides, it also makes this suspension trainer more versatile and stable than many others. It’s also an extremely strong piece of equipment, owing to the high quality materials it’s constructed from. It’s very easy to use, albeit most suitable for permanent use in your home workout space rather than as a travel suspension trainer. Finally, although it isn’t the least expensive suspension trainer on the market, it certainly isn’t the most expensive, and for what you get, it’s good value for money. 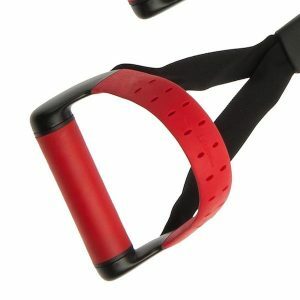 If you believe that this is the suspension trainer for you, you can check the current price here. Thanks for checking out the Lifeline Jungle Gym XT review. Leave any questions or comments you have in the comments section below. As always, all the best with your home workouts. Remember: When it comes to exercising at home, we can make the effort or we can make excuses, but we can’t make both!